To determine the cytokine levels in vitreous samples of diabetic macular edema (DME) patients in comparison with nondiabetic patients, and to evaluate the effect of subretinal fluid on the cytokine levels of vitreous samples. 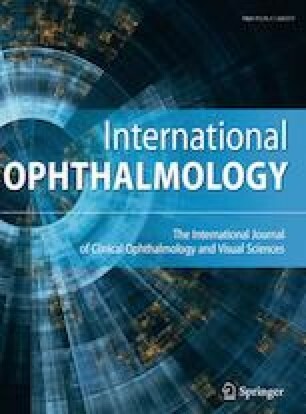 In this prospective case–control study, 11 eyes of 11 patients with DME and subretinal fluid, 11 eyes of 11 patients with DME without subretinal fluid, and 14 eyes of 14 patients who had undergone vitreoretinal surgery for the epiretinal membrane or a macular hole (control group) were evaluated. The blood glycated hemoglobin (HbA1c) level, vitreous vascular endothelial growth factor (VEGF), and interleukin-8 (IL-8) levels were determined. The vitreous VEGF level of patients in DME groups was significantly higher than the control group (p < 0.001) without significant difference between DME patients with and without subretinal fluid (p = 0.796). The vitreous IL-8 level of DME patients with subretinal fluid was significantly higher than both control (p = 0.002) and DME without subretinal fluid groups (p = 0.019). The blood HbA1c level was significantly higher in DME group with subretinal fluid than those without subretinal fluid (8.7 ± 1.32 and 7.1 ± 1.13%, respectively, p = 0.010). The only significant correlation was between vitreous VEGF level and blood HbA1c level in DME patients without subretinal fluid (r = 0.813, p = 0.002). IL-8 level in vitreous samples was higher in DME patients with subretinal fluid than those without subretinal fluid, suggesting that inflammation is an important factor in the progression of DME leading to the subretinal fluid formation in diabetic patients. This study was supported by Kocaeli University Scientific Research Project Coordination Unit (KOU-BAP: Project Number: 2014/83-84HD, 2015/49-50HD). Institutional Review Board Approval Number: KOÜ KAEK 2014/155. This study was supported by Kocaeli University Scientific Research Project Coordination Unit (KOU-BAP: Project Number: 2014/83-84HD, 2015/49-50HD). All procedures performed in studies involving human participants were in accordance with the ethical standards of the institutional ethical committee with the 1964 Helsinki Declaration and its later amendments or comparable ethical standards. Institutional Review Board Approval Number: KOÜ KAEK 2014/155.